I haven’t written a post since I got to Newfoundland (with the accent on the third syllable, not the second) and to be honest, it’s because I’m at a loss as to how to describe this place. The nicest people I’ve met while traveling through the Maritimes have told me the truly nicest people are the people of Newfoundland – and they are right. I’m going to break this trip into a few posts, but first I must try to describe what I have experienced. From my first morning in Newfoundland, having breakfast at Timmy’s in Port-aux Basques and spending two hours learning from a local about working on Hibernia, the worlds largest oil platform off the coast of St. John’s, and towing icebergs out of the platforms path, I knew this was a special place. Many people come to this island, hop on the TCH (Trans Canada Highway) stop in Corner Brook or Deer Lake, then zip on up to Gros Morne, without ever experiencing the true hospitality that exists in the small settlements along the coast of Newfoundland. It was a pleasure to “need a bit of direction”, because I was also guaranteed a great conversation, complete with the local dialect, and an offer of something, whether it was a refill of cold water, supper, or the last cold beer. The scenery on this island is unmatched and my photos certainly don’t do it justice. Slight detour, I’m typing this from The Cat Stop, the local pub in Norris Point (bear that in mind if you decide to read further) and a whale just surfaced right off the back porch where I am sitting, I spit beer onto my laptop and yelled “holly crap”, everyone looked at me, I pointed to the whale, the locals shrugged it off as an everyday occurrence, the tourists snapped photos, and everything is good now – this island really is paradise. 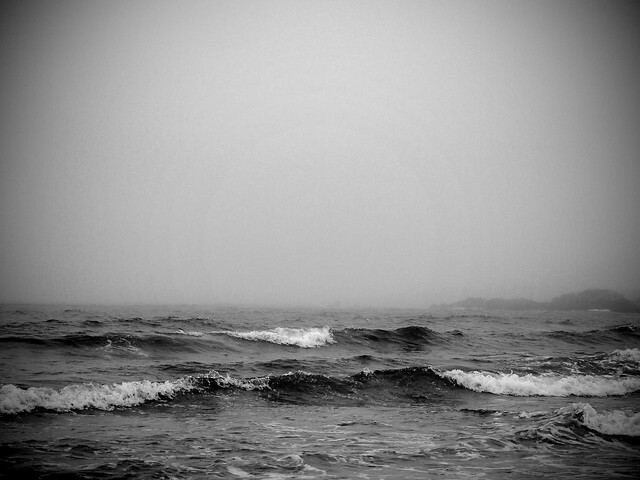 Anyway, my first day was overcast and damp, but it was a perfect day to cycle along the ocean. 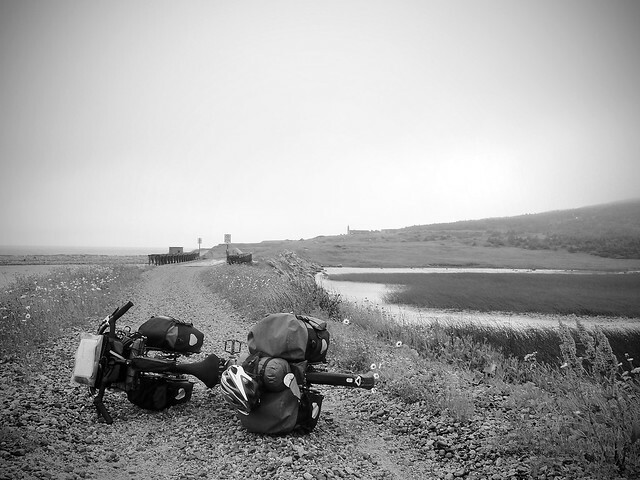 I headed out of Port-aux Basques around 3:00pm along the T’Railway, or better known in Newfoundland as “the old rail bed”. There’s part of me that wishes it was sunny, but then I wouldn’t have experienced the dramatic scenery the clouds presented. I quickly realized that 200K, or even 100K days were not going to happen here. The riding was a little sandy and rough, but it was the walks on the beach that slowed me down. Newfoundland is not a place to rush through. 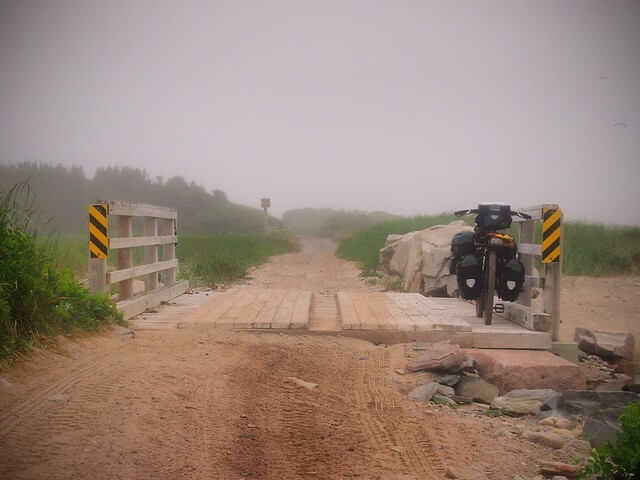 The T’Railway is primarily and ATV (or bikes as they are known up here, and I ride a pedal bike) trail and runs right through the heart of the small settlements along the cost of this island. I met Curtis, a 17 year old who wants to be a welder. 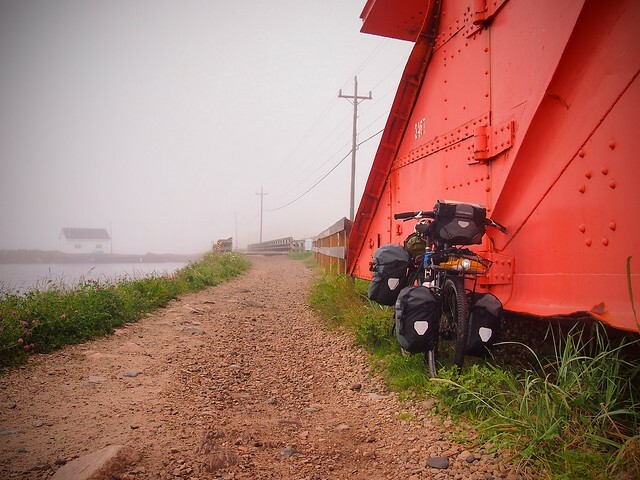 He’s never left the west cost of Newfoundland, but can’t wait to, and if I was 17, I would want to leave as well, but at 40….. We talked for a while about getting in trouble in school, life dreams and independent learning, as opposed to formal education. As one who took the former route and found a bit of trouble in school, I really enjoy taking with teenagers and hopefully showing them there is an alternative to driving the square peg through the round hole, as society wants us to do. I continued north on the T’Railway to Red Rocks, one of my favorite parts of the old rail bed so far. 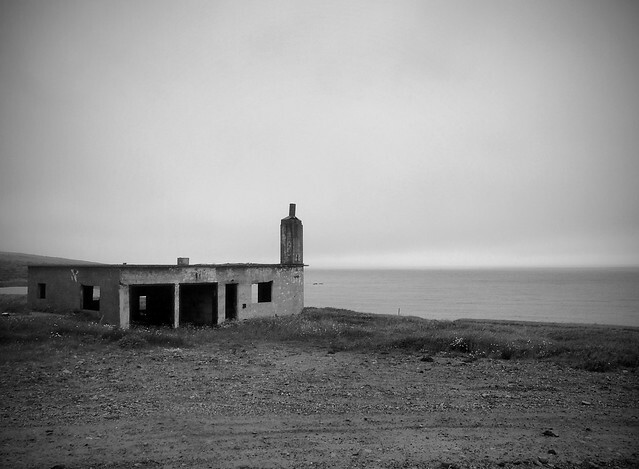 Abandoned buildings right on a foggy ocean, truly an amazing place. I’m going to leave this here for now, but I will say, everyday on this island has been more relaxing than the last.